Signs of destitution and revival blend in the North Lawndale neighborhood. In 1970, the community had a single-digit unemployment rate before rising sharply and staying above 20 percent in the decades since then. Photos by Kayla Bensing. All kinds of bottles blend in amid the green grass and lengthy dandelions growing on the vacant lot with the broken fence on the corner of 16th Street and Springfield Avenue. Seagram’s gin and vodka bottles. Fat Tire and Miller Genuine Draft bottles. Glass fruit juice and plastic water bottles. Tiny shards of glass glint in the morning sunlight on the sidewalk, near the words “Outlaw” and “Pistol said breath” that have been scratched into the sidewalk’s cement. Used coffee cups lie near discarded cigarette boxes and Cheetos bags. Not all of the lots are vacant, but all of the houses on both sides of 16th Street between Ridgeway and Hamlin avenues are boarded up. So are the businesses for two consecutive blocks a little farther east. The wooden boards on some of the stores look faded and tired. Men of varying ages sit on their back porches, stand in bunches outside the Lawndale Food Mart and talk in the parking lot outside of Creative Salon. 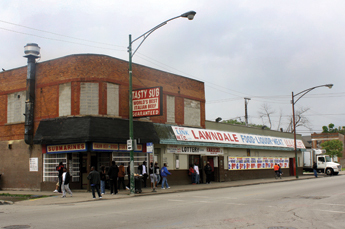 North Lawndale has been the site of similar scenes for more than a generation. Along with East and West Garfield Park, the community has had unemployment rates of at least 20 percent since 1980, shows a Chicago Reporter analysis of census data on unemployment from 1960 to 2000. The rates have been among the city’s highest. But it has not always been this way, and Edward “Mr. Ed” Muldrow Jr. remembers when community life was different. Muldrow, who for 42 years has owned Del-Kar pharmacy on the corner of Ridgeway Avenue and 16th Street, ticks off the names of area businesses as if he is reciting a list of favorite songs: A Sunbeam factory. An Italian deli. A clothing store. A pool hall. Black-and-white pictures of that more prosperous time ring the top of the clean and neatly kept store. North Lawndale’s unemployment rate was in the single digits in 1970 before rising precipitously. By contrast, in 1960, the Loop had by far the city’s highest level of male unemployment, with more than 17 percent of male workers out of work. But while the Loop rose in subsequent decades, due to a combination of development and city investment that made it a tourist center and an attractive and popular location for corporate headquarters, the South and West Sides suffered severe downturns as the industrial and manufacturing economies tumbled in the ’70s and ’80s. The changes in the Loop’s employment levels demonstrate that neighborhood uplift is possible, given sufficient resources and support. As part of community uplift on the West Side, an adjustment in the city’s workforce development to meet the realities of the 21st century economy is needed, said Greg Schrock, an assistant professor of urban studies at Portland State University. He emphasized the importance of bringing jobs to the community and helping people advance within those jobs. When major workforce legislation was first passed during the Great Society of the Johnson administration, the emphasis was on getting people jobs. From there, he said, workforce developers could have faith that workers who plugged away could rise in pre-established career paths within the industry they had chosen and for which they had been trained. The global economy has disrupted that previous order in nearly all industries, and the workforce development system has yet to adjust. As a result, the prior push to help a job seeker transition from unemployment to work may no longer be sufficient, Schrock said. Instead, he proposed a more ongoing combination of work and training that may occur at two or three separate intervals during a worker’s career. Evelyn Diaz, CEO of the Chicago Workforce Investment Council, said the city is looking to adopt such an approach. Her plan is to bring together people involved in workforce development from across the city together to focus on communities with chronically high levels of unemployment that have risen even higher during the current recession. Some movement is already happening. The Lawndale Christian Development Corp. is spearheading the construction of the Dr. Martin Luther King Legacy project on the corner of Hamlin Avenue and 16th Street, just south of where the civil rights leader stayed during his 1966 campaign to end slum housing.